If your doctor has set out a path of treatment for recovering from your frozen shoulder, remember it is a slow process and you need to give treatment time to work. Even with stretching your shoulder daily and applying the conservative therapies (cold and Deep Tissue Regeneration Therapy via use of the DTR Therapy), it still may take months to retsore normal shoulder movements. the state of your injury (acute that required surgery or did it just happen with no clear reason). Don't be discouraged! Your hard work by sticking to your 'path of treatment' will pay off and you will get your life back! Start out slow, and do not push yourself too much at first. Let your pain be your guide. If an exercise hurts too much, modify it or stop doing it. It is important to stretch your whole shoulder, 5 times a day, holding each stretch for at least 30 seconds. You should feel your shoulder stretching. If stretching does not cause you pain that lasts at least 5 minutes, then you have not stretched hard enough. If stretching causes pain that last longer than 15 minutes you have stretched to hard. Frozen Shoulder Exercises Or Stretches? Stage 1 - Freezing; you will slowly have more and more pain. As the pain worsens, you lose more use of your arm and shoulder. Freezing typically lasts from 6 weeks to 9 months. You will be in a lot of pain and your doctor will suggest cold compression or medication to control your pain levels. NO aggressive exercises or physical therapy should be undertaken at this stage, just daily use of the Shoulder T•Shellz Wrap® to keep it from completely losing range of motion and the use of a Cold Compress or Ice Pack when there is swelling or inflammation. Doing too much at this point can lead to more damage and a more difficult time completely recovering from frozen shoulder. Be wary of using a sling and/or shoulder brace too frequently in Stage 1 of a frozen shoulder condition. 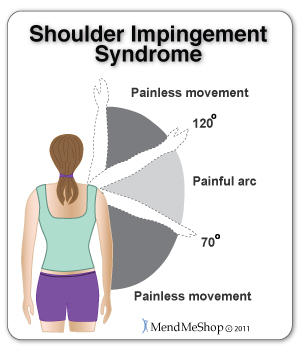 This may prevent necessary movement in your shoulder, and can make the situation worse. It is helpful to limit painful movements, but remember to perform at least gentle movements around your shoulder to keep circulation and blood flowing. Stage 2 - Frozen; During the 4 to 6 months of the "frozen" stage, daily activities may be very difficult. Your pain levels will have reduce quite a bit since stage 1, but the stiffness remains. This will be the time you become more active by starting physical therapy or at home exercises. Your shoulder will still be stiff and in pain but less pain than before. You will be working hard to breaking up the scar tissue that has formed inside the joint capsule - the goal is to regain as much range of motion as possible. Stage 3 - Thawing; Shoulder motion slowly improves during the "thawing" stage. Complete return to normal or close to normal strength and motion typically takes from 6 months to 2 years. Your home stretching exercises and/or physical therapy will be more aggressive and you can tolerate more movement of your shoulder. At this point of your recovery stretching is very important to continue breaking up the scar tissue so your body can rebuild with healthy tissue. You will ultimately be working to regain 100% function of your shoulder. No matter who you are or your reasons, if you want to properly deal with your frozen shoulder injury and minimize the negative impact it will have on your life, you need to speak with your doctor about adding to your treatment with AidMyFrozenShoulder's system using Deep Tissue Regeneration Therapy via use of a Shoulder TShellz Wrap. We have many happy customers that enhanced their healing rate and overall recovery from frozen shoulder faster than they expected and significantly reduced their pain during treatment and exercises. Understanding How Frozen Shoulder Stretching Can Help You Get Back Your Life! 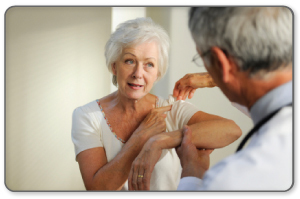 When you first contracted frozen shoulder disease, you may have had a hard time moving your arm and/or shoulder. Maybe you had to crawl out of bed with limited use of your arm and went to the medicine cabinet to reach for some pain killers. Movement induced strain causes microtears which cause inflammation - and inflammation causes more pain. As the process continues your body will fill in these microtears of your shoulder with dense, brittle tissue called "scar tissue". The human body will use scar tissue as a temporary solution and will try to build the scar tissue as fast as possible to bind tears together. Scar tissue can form fast to bring together the edges of a tear(s), but working fast doesn't mean that the job's done right. When scar tissue forms it doesn't come together as neatly as regular (healthy) tendon/ligament tissue would. Scar tissue fibers will lay down over top of your tear in a cluttered, messy and jumbled up way. The scar tissue that forms in your shoulder issue will be unorganized and won't line up properly with the healthy tissue surrounding the tear. This scar tissue will attach to everything in and around your shoulder injury including the surrounding healthy tissue as well. This can result in a long-term fusing together of your tendons/muscles/ligaments that drastically stiffen your shoulder, reducing mobility, and making your injury even more painful! Scar tissue is the MAIN reason why your shoulder injury just hasn't healed. Even when the inflammation is gone, scar tissue will still be there to wreak havoc on your shoulder movement and range of motion. On-going issues with scar tissue can even result in the return of frozen shoulder or a different injury such as a rotator cuff tear. Scar tissue will form fast to deal with a strain or tear to one of the tendons, ligaments, or muscles in your shoulder, but working fast doesn't mean that the job's done right. When scar tissue forms it doesn't come together as neatly as regular (healthy) tissue would. Scar tissue fibers will lay down over top of your tear in a cluttered, messy and jumbled up way. This is how scar tissue works. The scar tissue that forms in your shoulder joint will be unorganized and won't line up properly with the healthy tissue surrounding the injury site. This scar tissue will also attach to everything in that area, including the surrounding healthy tissue as well. This can result in a long-term fusing together of the soft tissue in your shoulder that stiffens your joint reducing your mobility and making your injury even more painful! Scar tissue is a major problem especially when it comes to frozen shoulder injuries that can sometimes take up to 2 years to heal! Time is the only way for your frozen shoulder to heal completely, but with the use of exercise/stretching and the application of the Shoulder T•Shellz Wrap® at the right times, you can speed your healing, soften scar tissue and avoid re-injury. You can quickly soften scar tissue and prevent further injury to your shoulder by increasing blood flow to that area. Treating yourself with a Shoulder TShellz Wrap is the easiest and most effective way to accelerate your recovery and deal with stubborn scar tissue. When applied before activity or work, the Shoulder TShellz Wrap will also relax and lengthen your soft tissue to help improve your range of motion and prevent atrophy (wasting away) of the tendons and ligaments in your shoulder and arm. Overall, continued treatment with the Shoulder TShellz Wrap will maintain good health in your shoulder and significantly reduce your risk of reinjury. Now this is where stretching your shoulder to recover from 'frozen' shoulder is key. Before stretching, exercise (or any movements that you expect to aggravate your shoulder) apply the Shoulder T•Shellz Wrap®. Use of the Shoulder T•Shellz Wrap® will increase blood flow in the shoulder while gently warming your soft tissue. This warminf of soft tissue increases elasticity and flexbility of the shoulder, decreasing the risk of shoulder strain while undergoing exercise or stretching. Your hard work will help prevent build up of more scar tissue and allow your shoulder to heal more quickly. Once you start doing this you will regain more range of motion, be more pain free and life will return to normal more quickly for you. Acupuncture, massage (Bowen technique) or chiropractic sessions have also been known to reduce pain and treatments can range anywhere from 1 - 6 weeks. Using a Cold Compress or Ice Pack will allow you to manage pain while getting rid of swelling, inflammation and edema in your shoulder. Massage techniques such as advance deep tissue massage, active release techniques and cross-fiber friction has been proven very effective for scar tissue removal, but overall these can be very painful and if done incorrectly can cause more damage to the shoulder than good. Mobility aids such as long shoe horns, front fastening bras, and/or anything that helps to prevent you from over-reaching or reaching behind your back may be helpful in your recovery. Alternative medications like cortisone injections will help only with symptoms and do not deal with the actual injury. It's designed to reduce inflammation by slowing down the blood flow to the area that is trying to heal your injury. Yes, you may feel temporary pain relief, but at the high cost of re-injury or your frozen shoulder injuries not even healing at all! 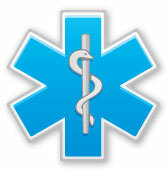 Nonprescription pain medications, such as acetaminophen; these should be taken with CAUTION. Pain killers are not helpful for long-term healing of frozen shoulder injuries, because the pain killers will allow you to tolerate pain during your daily life. Since pain medication maskes the pain of the injury, it becomes much easier for your injury to get much worse because you don't feel the pain and push yourself beyond what your body is capable of doing. If you decide to rely on pain killers alone you'll soon see for yourself (if you haven't already) that your injury will get worse causing you to suffer with frozen shoulder for years. When treating a frozen shoulder or any soft tissue injury, an effective therapy will increase blood flow to the injury while your shoulder is immobile. This is Critical in Stage 2 and 3 of frozen shoulder! 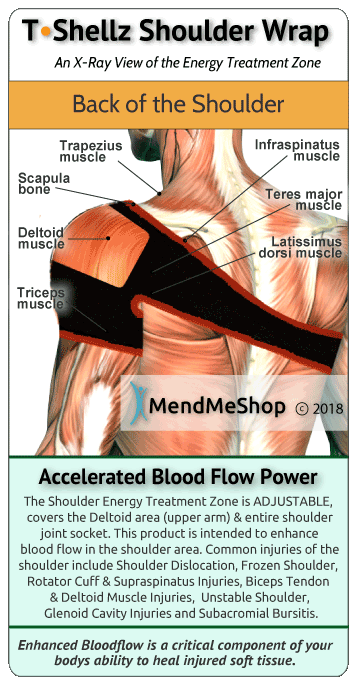 The Shoulder TShellz Wrap is a highly effective blood flow stimulator approved by the FDA for use at home. State of the art production facilities with a regimented quality control process ensure that you will receive a product that is designed to be safe and does what it is supposed to do...quickly relieve pain and aid in the recovery from shoulder related soft tissue injuries. How Does the Shoulder TShellz Wrap Promote Deep Tissue Regeneration Therapy? Electromagnetic energy provides a wide range of health benefits for those not only suffering from a frozen shoulder, but for many other soft tissue injuries as well. Your injured shoulder will heal at an accelerated rate with reduced potential for re-injury. Before and after shoulder release surgery, manipulation surgery or during rehabilitation, to warm up your shoulder before physical therapy exercising or stretching. Anytime you have sore or aching tissue in and around your shoulder. The final step in frozen shoulder rehabilitation is stretching - this is a critical step for complete recovery from your frozen shoulder! Working to align the healthy new tissue and break-up scar tissue is an important part of your recovery from frozen shoulder. It is important to note that exercising and stretching is most helpful during the 2nd and 3rd stages of the frozen shoulder condition. Exercises or stretching during Stage 1 ('freezing') could be more damaging to your shoulder extend your recovery process even longer. This is when you are in the 'frozen' and 'thawing' process - meaning you are experiencing the worst of your injury with maximum limitation on your mobility. With the guidance of your doctor or physical therapist, as to what frozen shoulder exercises work best for you an your specific range of shoulder movements. It may seem hard to believe, but our Shoulder TShellz Wraps will assist you in recovering from your frozen shoulder faster. Reduce your chance of suffering from degenerative conditions (like arthritis) by maximizing blood flow where it's needed most and reducing swelling / inflammation induced pain. If you want to avoid re-injury, or manage pain and increase circulation for lifelong health benefits a Shoulder TShellz Wrap will provide the results you are looking for. Why spend time in pain, off from work, and missing out on your active lifestyle when you can be proactive about your injury and the health of your body? Talk to your doctor about incorporating a regular routine of using Deep Tissue Regeneration Therapy.